Since we’re going on bit of a luxury tiny home kick this week I managed to find one ready and waiting for a new owner just outside of Edmonton. Rarely does one this nice go up for sale, usually you have to have one commissioned which means you have to wait. For those wanting something ready-made that’s fitted with a lot of bespoke touches can have it all with this luxury tiny house. It’s fitted on a trailer already and features a low body, tube style chassis that allows the lofts to have over 50″ of head room. The tiny house trailer also features a generous 25 year warranty. The custom kitchen in this luxury tiny home is a chefs dream, and it features a large 30” range hood along with a triple burner Mediterranean Marine stove. The kitchen also features antique hickory cabinetry with hand built baltic birch cabinet boxes. My favorite feature is the custom built 12′ hickory butcher block counter top. Right behind the stove, you’ll find the floating hickory staircase which leads into the spacious loft which is capable of fitting a California king sized bed. This is a home capable of full time living, or an incredible home with all the comforts you can tow all over the country. The bathroom is also quite spacious featuring a tub, shower, toilet and room for a bit of storage. This feature combined with the amazing kitchen and large loft makes this luxury tiny home the best ready-made one on the market in Canada. For those worried about the weather will be happy to know it has been prepped for even the coldest of winters. Inside you’ll find a $15,000 in-floor heating system with smart boiler i-link compatibilities. Inside the walls there is 3 1/2″ to 4″ of eco-friendly SprayFoam insulation that completely encases the entire home. If you’re interested in buying this luxury tiny house you can call the seller Brian directly at 780-812-9317 or email him b_mckale@hotmail.com to learn more. 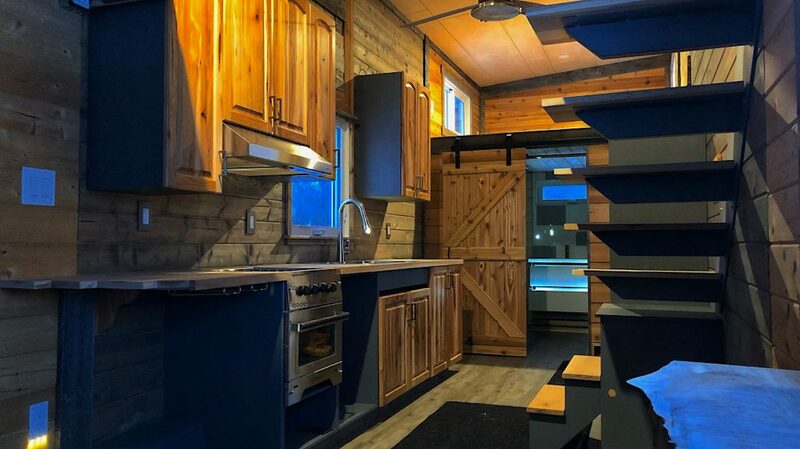 It’s currently on the market for $119,000 CAD and it was the nicest luxury tiny home we found for sale right now.